An OpenDJ implementation will contain certain data that you would like to explicitly grant or deny access to. 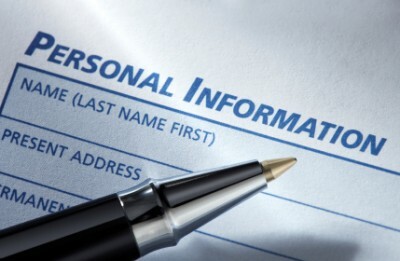 Personally identifiable information (PII) such as a user’s home telephone number, their address, birth date, or simply their email address might be required by certain team members or applications, but it might be a good idea to keep this type of information private from others. On the other hand, you may want their office phone number published for everyone within the company to see but limit access to this data outside of the company. Before you are allowed to perform any action within OpenDJ, it must first know who you are. Once your identity has been established, OpenDJ can then ascertain the rights you have to perform actions either on the data contained in its database(s) or within the OpenDJ process, itself. Note: Access control is not defined in any of the LDAP RFCs so the manner in which directory servers implement access control varies from vendor to vendor. Many directory services (including OpenDJ) follow the LDAP v3 syntax introduced by Netscape. Access control is implemented with an operational attribute called aci (which stands for access control instruction). Access control instructions can be configured globally (the entire OpenDJ instance) or added to specific directory entries. This returns the following results on a freshly installed (unchanged) OpenDJ server. Access control instructions may also be applied to any entry in the directory server. This allows fine grained access control to be applied anywhere in the directory information tree and therefore affects the scope of the ACI. Note: Placement has a direct effect on the entry where the ACI is applied as well as any children of that entry. By default, there are no ACIs configured at the entry level. The following is an example of ACIs that might be returned if you did have ACIs configured, however. The syntax for access control instructions is not specific to OpenDJ, in fact, for the most part, it shares the same syntax with the Oracle Directory Server Enterprise Edition (“ODSEE”). This is mainly due the common lineage with Sun Microsystems, but other directory servers do not use the same syntax and this makes migration more difficult (even the schema in both servers contains an attribute called aci). If you export OpenDJ directory entries to LDIF and attempt to import them into another vendor’s server, the aci statements would either be ignored, or worse, might have unpredictable results, altogether. The following syntax is used by the OpenDJ server. Access control instructions require three inputs: target, permission, and subject. The target specifies the entries to which the aci applies. The subject applies to the client that is performing the operation and the permissions specify what the subject is allowed to do. You can create some very powerful access control based on these three inputs. The syntax also includes the version of the aci syntax, version 3.0. This is the aci syntax version, not the LDAP version. Finally, the syntax allows you to enter a human readable name. This allows you to easily search for and identify access control statements in the directory server. Note: Refer to the OpenDJ Administration Guide for a more detailed description of the aci A components. The following is an example of an ACI that permits a user to write to their own password and mobile phone attributes. If you place this ACI on a particular user’s object (i.e. uid=bnelson, ou=people,dc=example,dc=com), then this ACI would only apply to this object. If you place this ACI on a container of multiple user objects (i.e. 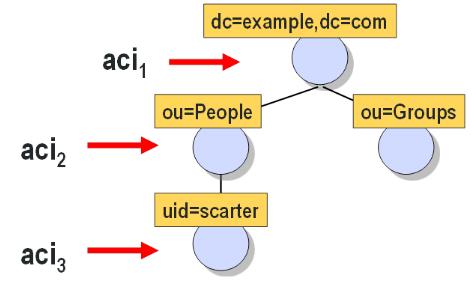 ou=people,dc=example,dc=com), then this ACI would apply to all user objects included in this container. Access control instructions provide fine-grained control over what a given user or group member is authorized to do within the directory server. When a directory-enabled client tries to perform an operation on any entry in the server, an access control list (ACL) is created for that particular entry. The ACL for any given entry consists of the entry being accessed as well as any parent entries all the way up to the root entry. The ACL is essentially the summation of all acis defined for the target(s) being accessed plus the acis for all parent entries all the way to the top of the tree. Included in this list are any Global ACIs that may have been configured in the cn=config as well. While not entirely mathematically accurate, the following formula provides an insight into how the ACL is generated. If there exists at least one explicit DENY rule that prevents a user from performing the requested action (i.e. deny(write)), then the user is denied. If there exists at least one explicit ALLOW rule that allows a user to perform the requested action (i.e. allow(write)), then the user is allowed (as long as there are no other DENY rules preventing this). If there are neither DENY nor ALLOW rules defined for the requested action, then the user is denied. This is referred to as the implicit deny. Thought 1: If in the absence of any access control instructions, the default is to deny access, then what is the purpose of access control instructions you might ask? ACIs with ALLOW rules are used to grant a user permission to perform some action. Without ALLOW ACIs, all actions are denied (due to the implicit deny rule). Thought 2: If the default is to implicitly deny a user, then what is the purpose of DENY rules? 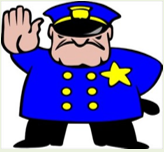 DENY rules are used to revoke a previously granted permission. For instance, suppose that you create an ALLOW rule for the Help Desk Admin group to access a user’s PII data in order to help determine the user’s identity for a password reset. But you have a recently hired Help Desk Admin that has not completed the required sensitivity training. You may elect to keep him in the Help Desk Admin group for other reasons, but revoke his ability to read users’ PII data until his training has been completed.Note: You should use DENY rules sparingly. If you are creating too many DENY rules you should question how you have created your ALLOW rules. Thought 3: If the absence of access control instructions means that everyone is denied, then how can we manage OpenDJ in the event that conflicting ACIs are introduced? Or worse, ACIs are dropped altogether? That is where the OpenDJ Super User and OpenDJ privileges come in. The RootDN user (“cn=Directory Manager” by default) is a special administrative user that can pretty much perform any action in OpenDJ. This user account is permitted full access to directory server data and can perform almost any action in the directory service, itself. Essentially, this account is similar to the root or Administrator accounts on UNIX and Windows systems, respectively. If you look in the directory server you will find that there are no access control instruction granting the RootDN this unrestricted access; but there are however privileges that do so. While access control instructions restrict access to directory data through LDAP operations, privileges define administrative tasks that may be performed by users within OpenDJ. Assignment of privileges to users (either directly or through groups) effectively allows those users the ability to perform the administrative tasks defined by those privileges. 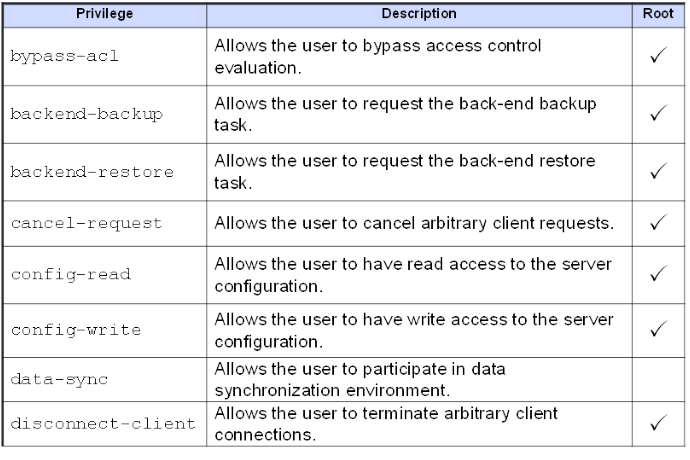 The following table provides a list of common privileges and their relationship to the RootDN user. The RootDN user is assigned these privileges by default and similar to Global ACIs, these privileges are defined and maintained in the OpenDJ configuration object. The following is the default list of privileges associated with Root DN users (of which the Directory Manager account is a member). or simply by opening the config.ldif file and locating the entry for the “cn=Root DNs” entry. Most operations involving sensitive or administrative data require that a user has both the appropriate privilege(s) as well as certain access control instructions. This allows you to configure authorization at a fine grained level – such as managing access control or resetting passwords. Privileges are assigned to users and apply globally to the directory service. Any user can be granted or denied any privilege and by default only the RootDN users are assigned a default set of privileges. Note: Consider creating different types of administrative groups in OpenDJ and assign the privileges and ACIs to those groups to define what a group member is allowed to do. Adding users to that group then automatically grants those users the rights defined in the group and conversely, removing them from the group drops those privileges (unless they are granted through another group). Once you set up a number of ACIs, you may find it difficult to understand how the resulting access control list is processed and ultimately the rights that a particular user may have. Fortunately OpenDJ provides a method of evaluating the effective rights that a subject has on a given target. You can use the ldapsearch command to determine the effective rights that a user has on one or more attributes on one or more entries. The preceding search is being performed by the Root DN user (“cn=Directory Manager”). It is passing the –g option requesting the get effective rights control (to which the Directory Manager has the appropriate access configured). The command wants to determine what rights the Help Desk Administrator (uid=helpdeskadmin,…) has on Sam Carter’s entry (uid=scarter,…). The scope of the search has been limited only to Sam Carter’s entry using the base parameter. Finally, the search operation is returning not only the attributes, but the effective rights (aclrights) as well. The aclRights;attributeLevel;givenname notation indicate that this line includes the effective rights for the givenname attribute. Individual permissions are listed that demonstrate the rights that the Help Desk Administrator has on this attribute for Sam Carter’s entry (1 = allowed and 0 = denied). Enable the reject-unauthenticated-request property using the dsconfig command. Mark Craig provides a nice blog posting on how to turn off anonymous access using the dsconfig command. You can find that blog here. The other option is to simply change the reference in the Global ACIs from ldap:///anyone to ldap:///all. This prevents anonymous users from gaining access to this information. Note: Use of ldap:///anyone in an ACI includes both authenticated and anonymous users – essentially, anyone. Changing this to ldap:///all restricts the subject to all authenticated users. The following comments from Ludo Poitou (ForgeRock’s OpenDJ Product Manager) should be considered before simply removing anonymous access. You don’t want to remove the ACI rules for Anonymous access, you want to change it from granting access to anyone (ldap:///anyone) to granting access to all authenticated users (ldap:///all). This said, there are some differences between fully rejecting unauthenticated requests and using ACI to control access. The former will block all access including the attempts to discover the server’s capabilities by reading the RootDSE. The later allows you to control which parts can be accessed anonymously, and which shouldn’t. There’s been a lot of fuss around allowing anonymous access to a directory service. Some people are saying that features and naming context discovery is a threat to security, allowing malicious users to understand what the server contains and what security mechanisms are available and therefore not available. At the same time, it is important for generic purpose applications to understand how they can or must use the directory service before they actually authenticate to it. Fortunately, OpenDJ has mechanisms that allow administrators to configure the directory services according to their security constraints, using either a simple flag to reject all unauthenticated requests, or by using ACIs. You should have one Root DN account and it should not be shared with multiple administrators. Doing so makes it nearly impossible to determine the identity of the person who performed a configuration change or operation in OpenDJ. Instead, make the password complex and store it in a password vault. Now that you have create administrative groups, you are ultimately going to need to provide certain users with more rights than others. You can create additional administrative groups, but what if you only need one user to have these rights. Creating a group of one may or may not be advisable and may actually lead to group explosion (where you end up with more groups than you actually have users). Instead, consider associating privileges to a particular user and then create ACIs based on that user. In real life we tend to value those traits that make us unique from others; but in an identity management deployment uniqueness is essential to the authentication process and should not be taken for granted. In some cases this may be fine, but in others this may not be the desired effect as you may need to enforce uniqueness for attributes such as uid, guid, email address, or simply credit cards. To ensure that attribute values are unique across directory server entries you need to configure attribute uniqueness. 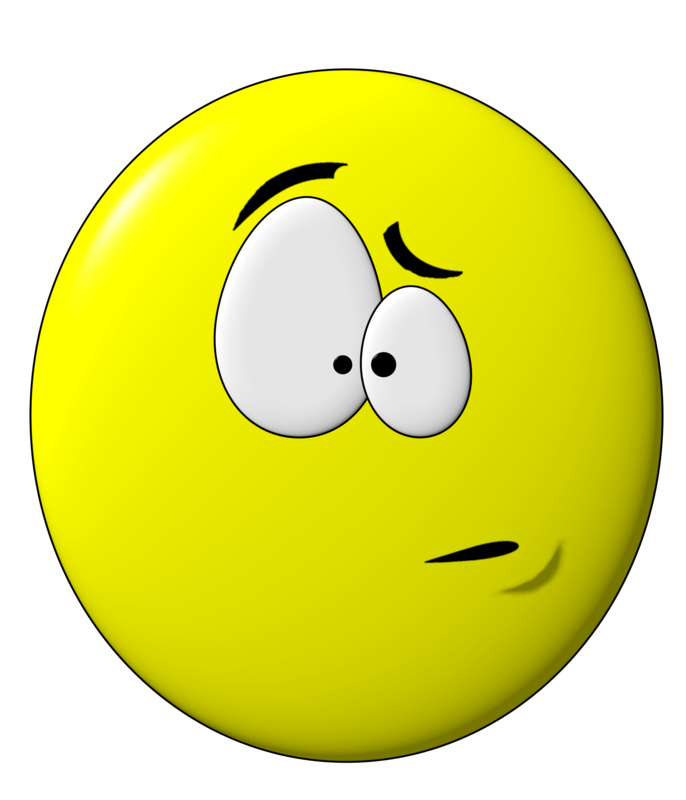 OpenDJ has an existing plug-in that can be used to configure unique values for the uid attribute, but this plug-in is disabled by default. You can find this entry in OpenDJ’s main configuration file (config.ldif) or by searching the cn=config tree in OpenDJ (assuming you have the correct permissions to do so). Leaving this plug-in disabled can cause problems with OpenAM, however, if OpenAM has been configured to authenticate using the uid attribute (and you ‘accidentally’ create entries with the same uid value). In such cases you will see an authentication error during the login process as OpenAM cannot determine which account you are trying to use for authentication. In both cases the base-dn parameter defines the scope where the the uniqueness applies. This is useful in multitenant environments where you may want to define uniqueness within a particular subtree but not necessarily across the entire server. The uniqueness plug-in requires that you have an existing equality index configured for the attribute where you would like to enforce uniqueness. The index is necessary so that OpenDJ can search for other entries (within the scope of the base-dn) where the attribute may already have a particular value set. OpenAM’s default settings (Data Store, LDAP authentication module, etc) uses the uid attribute to authenticate and uniquely identify a user. OpenDJ typically uses uid as the unique naming attribute in a user’s distinguished name. When combined together, it is almost assumed that you will be using the uid attribute in this manner, but that is not always the case. You can easily run into issues when you start coloring outside of the lines and begin using other attributes (i.e. mail) for this purpose. Armed with the information contained in this post, however, you should easily be able to configure OpenDJ to enforce uniqueness for any attribute. The OpenAM Authentication Service can be configured to lock a user’s account after a defined number of log in attempts has failed. Account Lockout is disabled by default, but when configured properly, this feature can be useful in fending off brute force attacks against OpenAM login screens. If your OpenAM environment includes an LDAP server (such as OpenDJ) as an authentication database, then you have options on how (and where) you can configure Account Lockout settings. This can be performed in either OpenAM (as mentioned above) or in the LDAP server, itself. But the behavior is different based on where this is configured. There are benefits and drawbacks towards configuring Account Lockout in either product and knowing the difference is essential. Note: Configuring Account Lockout simultaneously in both products can lead to confusing results and should be avoided unless you have a firm understanding of how each product works. See the scenario at the end of this article for a deeper dive on Account Lockout from an attribute perspective. Account Lockout is disabled by default; you need to select the “Login Failure Lockout Mode” checkbox to enable this feature. Once it is enabled, you configure the number of attempts before an account is locked and even if a warning message is displayed to the user before their account is locked. You can configure how long the account is locked and even the duration between successive lockouts (which can increase if you set the duration multiplier). You can configure the attributes to use to store the account lockout information in addition to the default attributes configured in the Data Store. These attributes are updated in the Data Store configuration for the realm. A benefit of implementing Account Lockout in OpenAM is that you can use any LDAPv3 directory, Active Directory, or even a relational database – but you do need to have a Data Store configured to provide OpenAM with somewhere to write these values. An additional benefit is that OpenAM is already configured with error messages that can be easily displayed when a user’s account is about to be locked or has become locked. Configuring Account Lockout within OpenAM, however, may not provide the level of granularity that you might need and as such, you may need to configure it in the authentication database (such as OpenDJ). OpenDJ can be configured to lock accounts as well. This is defined in a password policy and can be configured globally (the entire OpenDJ instance) or it may be applied to a subentry (a group of users or a specific user). Similar to OpenAM, a user’s account can be locked after a number of invalid authentication attempts have been made. And similar to OpenAM, you have several additional settings that can be configured to control the lockout period, whether warnings should be sent, and even who to notify when the account has been locked. But while configuring Account Lockout in OpenAM may recognize invalid password attempts in your SSO environment, configuring it in OpenDJ will recognize invalid attempts for any application that is using OpenDJ as an authentication database. This is more of a centralized approach and can recognize attacks from several vectors. Configuring Account Lockout in OpenDJ affects the following OpenDJ attributes: pwdFailureTime (a multivalued attribute consisting of the timestamp of each invalid password attempt) and pwdAccountLockedTime (a timestamp indicating when the account was locked). Another benefit of implementing Account Lockout in OpenDJ is the ability to configure Account Lockout for different types of users. This is helpful when you want to have different password policies for users, administrators, or even service accounts. This is accomplished by assigning different password polices directly to those users or indirectly through groups or virtual attributes. A drawback to this approach, however, is that OpenAM doesn’t necessarily recognize the circumstances behind error messages returned from OpenDJ when a user is unable to log in. A scrambled password in OpenDJ, for instance, simply displays as an Authentication failed error message in the OpenAM login screen. The value of the ds-cfg-lockout-failure-count attribute is 0; which means that user accounts are not locked by default – no matter how many incorrect attempts are made. This is one of the many security settings that you can configure in a password policy and while many of these mimic what is available in OpenAM, others go quite deeper. Rather than modifying the Default Password Policy, a preferred method is to create a new password policy and apply your own specific settings to the new policy. This policy can then be applied to a specific set of users. The syntax for using the OpenDJ dsconfig command to create a new password policy can be seen below. --type password-policy --policy-name "Example Corp User Password Policy"
--hostname localhost --port 4444 --trustAll --bindDN cn="Directory Manager"
Note: This example contains a minimum number of settings (default-password-storage-scheme, password-attribute, and lockout-failure-count). Consider adding additional settings to customize your password policy as desired. Another method of setting this password policy is through the use of a dynamically created virtual attribute (i.e. one that is not persisted in the OpenDJ database backend). The following definition automatically assigns this new password policy to all users that exist beneath the ou=people container (the scope of the virtual attribute). Note: You can also use filters to create very granular results on how password polices are applied. Configuring Account Lockout in OpenDJ has more flexibility and as such may be considered to be more powerful than OpenAM in this area. The potential confusion, however, comes when attempting to unlock a user’s account when they have been locked out of both OpenAM and OpenDJ. 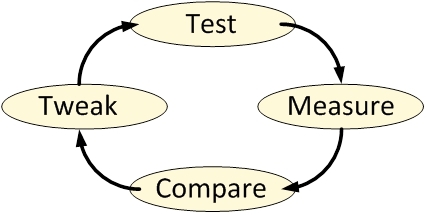 This is described in the following example. Consider an environment where OpenAM is configured with the LDAP authentication module and that module has been configured to use an OpenDJ instance as the authentication database. OpenAM and OpenDJ have both been configured to lock a user’s account after 3 invalid password attempts. What kind of behavior can you expect? 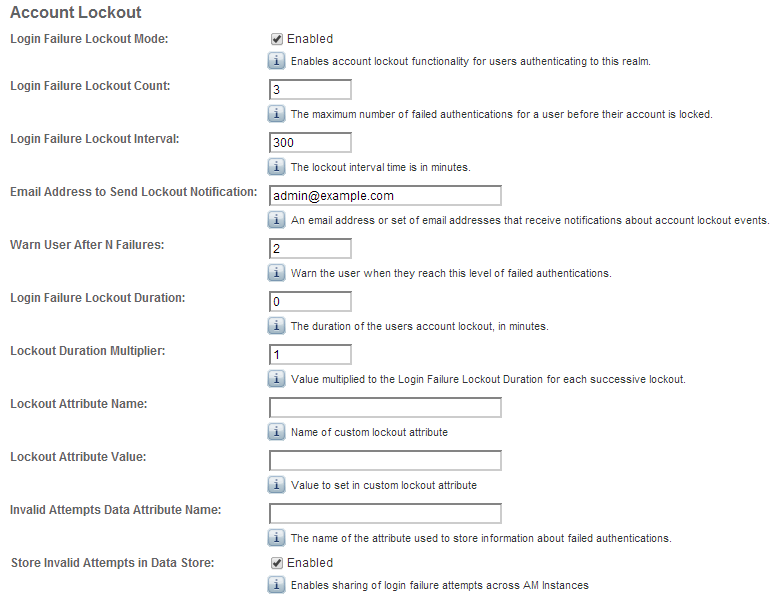 Let’s walk through each step of an Account Lockout process and observe the behavior on Account Lockout specific attributes. The user is currently active and Account Lockout specific attributes are empty. Step 2: Open the OpenAM Console and access the login screen for the realm where Account Lockout has been configured. You now see that there is a value for the pwdFailureTime. This is the timestamp of when the first password failure occurred. This attribute was populated by OpenDJ. OpenAM displays an error message indicating that the user’s account is not active. This is OpenAM’s way of acknowledging that the user’s account has been locked. You will note that the counters have all been reset to zero. 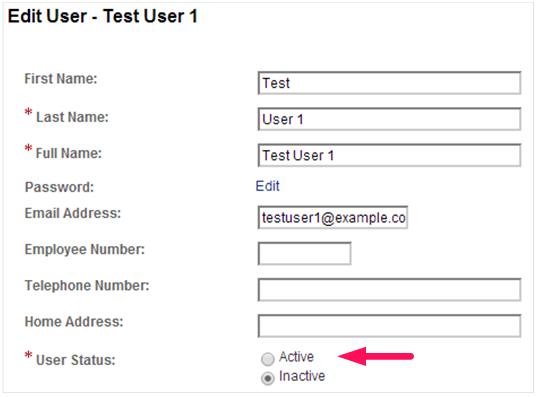 That is because the user’s account has been inactivated by OpenAM by setting the value of the inetuserstatus attribute to Inactive. Additionally, the third invalid password caused OpenDJ to lock the account by setting the value of the pwdAccountLockedTime attribute to the value of the last password failure. The problem with this approach is that while the user’s status in OpenAM is now made active, the status in OpenDJ remains locked. Attempting to log in to OpenAM with this user’s account yields an authentication error that would make most OpenAM administrators scratch their head; especially after just resetting the user’s status. This, however, requires two different interfaces for managing the user’s account. An easier method is to combine the changes into one interface. You can modify the inetuserstatus attribute using ldapmodify or if you are using the OpenAM Console, simply change the password while you are updating the user’s status. So go forth and wield your new found power; but do it in a responsible manner. Suppose that you have an OpenDJ directory server with 300,000 entries. And further suppose that the space consumed on your disk for said directory is 1.2 GB and made up of 114 database (*.jdb) files. 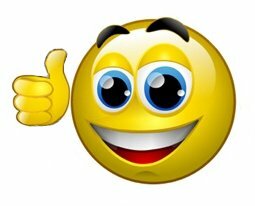 Suppose that you didn’t plan correctly and you are now running out of space on your hard drive. What should you do? Run to your local System Administrator and beg for him to increase the size of your partition? Before promising to buy him lunch for the next year or offering your first born child to mow his lawn, look to see if you actually need that much space in the first place. The first two items are relatively straight forward as you probably have a good idea of your data profile, but an improper indexing strategy can take you by surprise and may actually cause more harm than good. Indexes are used to increase search performance based on application search filters. Lack of necessary indexes can impact performance, increase aggravation, and lead to calls in the middle of the night. But maintaining indexes that are never used can unnecessarily increase disk space and impact the performance of write operations. Indexes on operational attributes are necessary to make OpenDJ run efficiently. You should never modify these unless instructed to do so by ForgeRock support. Standard attributes, however, are used to increase external application search performance and should reflect the types of searches being performed by your own applications. Default attributes (and index types) are based on ForgeRock’s observations of what most of its customers use, but you may not be like most of their customers and while maintaining some index types can be relatively benign, others (like SUBSTRING) may have a more dramatic effect. This demonstrates that the givenname value for entries 1, 3, 9, and 22 are all “Bill”. When OpenDJ receives a search for all entries that have a first name of “Bill”, it immediately knows that a match is found in records 1, 3, 9 and 22. It doesn’t even look at the other entries. 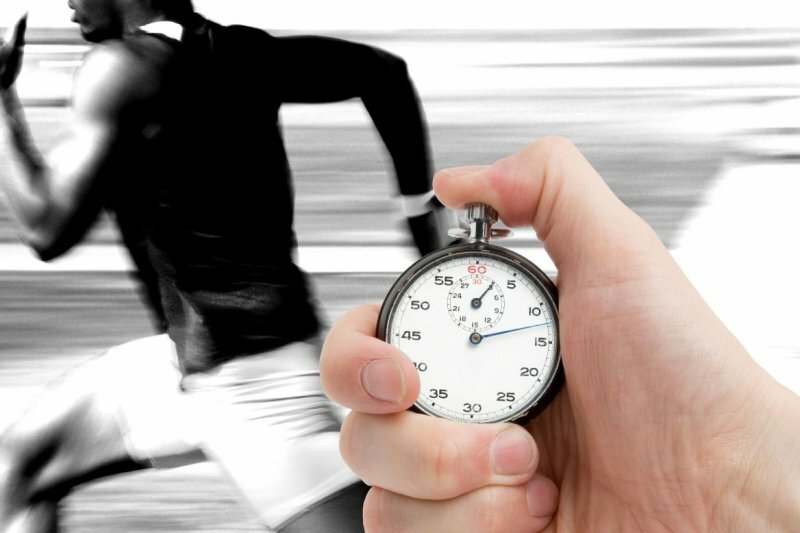 In a database that contains hundreds of thousands of entries, this can drastically increase search performance. This is all well and fine, but how can indexes actually impact us? Note: OpenDJ created entries for substrings consisting of four or more characters. These include the beginning of string (^) and end of string ($) characters; the shorter the string, the fewer entries that are created. Imagine how many entries would be generated if the attribute contained a value of ‘supercalifragilisticexpialidocious’! A recommendation is to maintain only those indexes for attributes that are included in your application search filters. The types of indexes selected should reflect the manner of searches being performed by your application. To determine this, you can review your LDAP-enabled applications and attempt to ascertain the types of filters it may be producing; but this may not be so obvious. A more realistic approach is to come up with a “best guess” and then monitor your server to see if your guess was accurate or not. You can then add, delete, or modify attribute indexes based on your findings. You should monitor your access logs for searches that take a long time and consider adding indexes for search times that you find unacceptable. This can be seen in the etime (or elapsed time) value which is displayed in milliseconds (by default). This is subject to your own SLAs, but etimes greater than 5 milliseconds may be considered unacceptable. If you see etimes in the order of seconds (as shown below) then you definitely need to investigate further. This access log entry indicates that the search took 5.8 seconds to complete. One reason why it took so long was that it was an unindexed search (as noted by the “unindexed” tag in the entry). To determine the filter associated with this search, you need to search backwards in the access log and find the corresponding SEARCH REQ for this connection (conn=2231288) and this operation (op=6). [31/Dec/2013:18:07:15 +0000] SEARCH REQ conn=2231288 op=6 msgID=502 base="ou=people,dc=example,dc=com" scope=wholeSubtree filter="(&(&(exampleGUID=88291000818)(objectclass=inetorgperson)))" attrs="*"
OpenDJ contains a default EQUALITY index for objectclass so assuming that you have not modified the default indexes, then the unindexed attribute causing the problem is exampleGUID. Now that you have identified the culprit, should you run right out and create an EQUALITY index for this attribute? Not necessarily. It really depends on how often you see searches of this type appear in the access logs and what their impact might be. You don’t want to maintain exampleGUID indexes if your application only searches on this attribute once in a blue moon. If, however, you see this type of search on a consistent basis, you might want to consider adding an index. Determine attribute names included in the search filter. Determine the frequency of the searches. Compare the searches to the already configured indexes. Remove unnecessary indexes (if desired). It is pretty easy to write a script to perform these steps and fortunately one has already been written by Chris Ridd to perform steps 1 through 4. His topfilters script can be found here. Once armed with the information from his script you would simply compare it to what you already have configured for OpenDJ. Current indexes are reflected beneath the cn=config suffix of your OpenDJ server. You can either query this suffix as the rootDN user or you can simply view the contents of the config.ldif file to see what indexes have been configured. Execution of this command will return each index, its type, the database it is associated with, whether the index is valid or not, and the number of records associated with the index. It will also detail the undefined index keys that are not maintained due to the ds-cfg-index-entry-limit being reached for that attribute. You can take the data returned from Chris’ script, compare it with the data found for those indexes you are currently maintaining and make an intelligent decision as to whether you want to modify your indexes in any way. Should you delete any indexes that you believe are not being used? Again, not necessarily. Your access logs only reflect a point in time and may not provide a comprehensive listing of application search filters. You should always carefully consider removing existing indexes, but if you find that you have made a mistake, you can always monitor the access log for searches that are taking an unacceptably long time – or wait for that 3:00 am phone call to let you know. If you do decide it is necessary to update your indexes, then the best approach is to do so using the OpenDJ Control Panel or the dsconfig command line tool. You should never update the config.ldif file directly. The following provides an overview of how to add a new index for the exampleGUID attribute. The index type is set to EQUALITY. The following provides an overview of how to remove an existing EQUALITY index type from an existing mail index. If you would rather remove the entire mail index, use the following command, instead. OpenDJ automatically updates indexes on LDAP operations that update the database. Adding or deleting an index or an index value is a configuration change, however, and does not affect index values already in the database. If you delete an index type, existing index values will remain in the database until you rebuild the index. The same is true if you add a new index or index type. Indexes will not be added for existing database entries until you rebuild the index. As such, any configuration changes to indexes should be followed by a rebuilding of the appropriate index. The following provides an overview of how to rebuild the mail index once its configuration has changed. Note: It is not necessary to stop the OpenDJ instance before performing this task. It has been my experience, however, that if you are able to stop the server you might want to consider doing so. If so, then you do not need to specify a start time, bind credentials, or the trust acceptance. These are not necessary as you will be initiating the connection immediately and directly to the database. There are times when you may see performance problems that indicate that you are performing an unindexed search, but when you look at the indexes, you find that the appropriate index has been configured. Note: This problem typically occurs when you do not rebuild the index after you have configured it. Essentially, there is already data in the database when the indexes were applied. In such cases, OpenDJ will not attempt to update the index until an initial rebuild-index has been performed. One method of debugging this problem is to use the debugsearchindex capability in OpenDJ. If you see something like this but your configuration tells you that the indexes have been configured, then it is time to send your LDAP administrator to training. As with most middleware products knowing when and how to configure indexes can be as much of an art as it is a science. You should follow best practices where possible, but as with other products you should monitor your server to see if those practices apply to you and react where appropriate. While teaching a recent ForgeRock OpenDJ class, a student of mine observed an interesting behavior that at first seemed quite odd. While rebuilding his attribute indexes, the student found that the overall database size seemed to grow each time he performed a reindex operation. What seems obvious to me now sure made me scratch my head as I scrambled for an answer. I am sharing my findings here in the hopes that others will either a) find this information useful or b) find comic relief as to my misfortune. Note: If you are unclear about the information contained in OpenDJ’s database files, then I highly recommend that you read my posting entitled, Unlocking the Mystery behind the OpenDJ User Database. In that article I describe the overall structure of the Berkeley DB Java Edition database used by OpenDJ and how both entries (and indexes) are maintained in the same database. In OpenDJ, the rebuild-index command is used to update any attribute indexes contained in the OpenDJ database. This is necessary after you make a configuration change that affects indexes (such as modifying the index entry limit). Indexes are database specific and you can elect to rebuild a single attribute index or rebuild all attribute indexes for a particular database. The student observed (and questioned) that every time he rebuilt the indexes, the aggregated size of the *.jdb files actually increased by some factor. In the case of a rebuild-all, it was about 18 MB each time he ran the command; in the case of rebuilding a single index, it was only about 3 MB each time. But the increase was consistent each time he rebuilt the index(es). This continued to occur until it reached a certain size at which time the consumption fell back to its original size (in our observations this occurred at roughly 200 MB when using the rebuild-all option). This trend was consistent over several iterations. We continued testing and observed that in addition to the increasing size, the database files on the file system (*.jdb) were changing as well. What was once 000000001.jdb and 000000002.jdb now became 000000002.jdb file and 000000003.jdb and later became 000000003.jdb file and 000000004.jdb. This occurred at the same time that we dropped back down to the 123 MB size and was the clue that unlocked the mystery. Unlike the Berkeley Sleepycat database used in OpenDJ’s forefathers, when data is modified in the OpenDJ database, it is not immediately removed from the database. Instead it is marked for removal and the record essentially becomes inactive. Updated records are then appended to the end of the database in a log file fashion. This process continues until OpenDJ cleaner threads detect that a database file contains less than 50% active records. Once that occurs, the cleaner threads migrate all active records from the file and append them to the end of the last file in the OpenDJ database (a new file is created if necessary). Once migrated, the cleaner threads delete the database file containing the stale entries. During the rebuild process, old index values in each of the *.jdb files are marked as inactive and new indexes are added to the database. Simply marking these indexes as inactive does not eliminate their existence in the database and they continue to consume disk space. This process continues until the point where the cleaner threads detect that old indexes account for > 50% of the database entries. At this point, the migration process occurs, new *.jdb files are created to store the new indexes, old stale *.jdb files are deleted (hence the *.jdb file name changes), and the disk space is returned. When an index is rebuilt, the whole btree is marked as deleted. But since it actually represents specific records of the database files, they will only be collected when the file itself reaches the threshold that triggers recollection. With small databases, you will see the behavior you’re describing. With larger databases, this will be less noticeable as the amount of index records will be larger and cleanup point may be reached faster.